A grainy, holga, look is what guitarist Nathan (artist name Redd Sun) told me he wanted for the edited versions of the photographs I made for him during our commercial photography shoot on Pass-A-Grille Beach. I kept that information in mind the whole time I was shooting, despite the setting sun providing a plethora of color in the wide Florida sky that evening. The grainy look is one of the things that interested me most about this shoot because 99% of the time when shooting on the beach vivid color shots are desired. I saw this as an opportunity to produce something different, something . . . simpler. 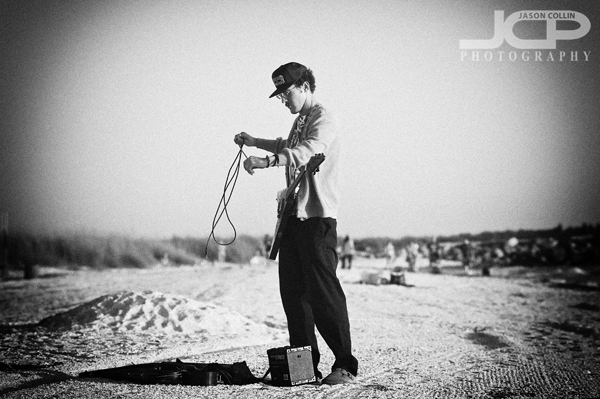 Commercial Photography for guitarist promotion - f/4 ISO 200 1/400th natural lightAfter seeing the results of this shoot, I may do an entire series of black & white beach shots. The holga effect was applied to the above photograph using the awesome Silver Efex Pro, which if you do not have it and you like black & white, then you need to get Silver Efex Pro immediately! Commercial Photography for musician promotion - f/4 ISO 200 1/400th natural lightI centered the subject (Nathan) much more than I normally would during this shoot because I knew that type of composition best lent itself to the holga effect with its harsh vertical edge burning. This is why it is always very important to previsualize a shot, or a whole shoot even, before pressing the shutter. This marks the first in what will be a continuing series of photography tips I will offer. You can follow them if you find them useful by subscribing or checking back regularly. The above photograph is an example of vanishing point composition. The train tracks are of course parallel to each other, but they appear to converge at a distance. Where they converge is the vanishing point. This adds a sense of depth and dimension to a 2D photograph. Besides train tracks, other subject matter that can be photographed using the vanishing point technique include: tunnels, winding roads, guard rails, high walled paths. These train tracks are across from the University of Tampa campus. I know there are also train tracks in downtown Tampa and near the brewery at Busch Gardens. If you live in an area that has a subway system, then you will have lots of vanishing point photography opportunities. Vanishing point composition does not need to follow the rule of thirds for composition. In fact, centering the vanishing point is often the most pleasing composition. For train tracks, I like to put the camera as low to the ground as possible. Using a tripod is a good idea too. As always, set your focus about 1/3 of the way into the frame. Please post a link to your own vanishing point photograph in the comments below!